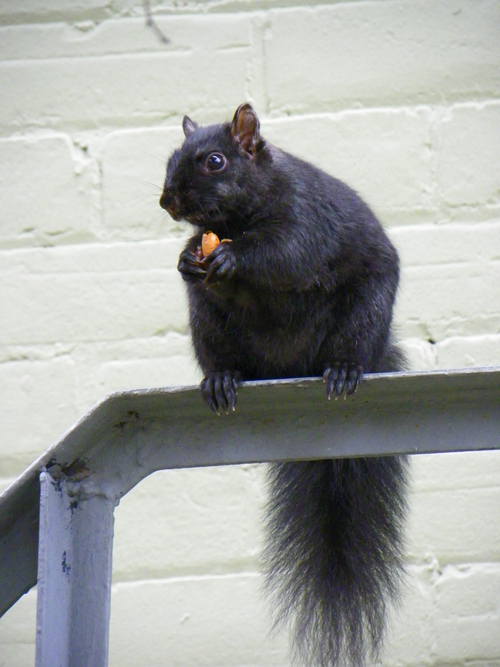 I know I have mentioned this before on my blog but I still can't get over the fact that the squirrels in Canada are black. How did that happen? How come none of them have migrated down to Rochester? Of course, they are just as chubby and cute as the ones in our backyard. We stood and took pictures and video of this fella gnawing on a peanut for quite awhile. There were black squirrels in Amherst, MA where I went to college. Get this though, I saw a white albino squirrel on the bike path near my house recently. It blew my mind! No pics to prove it though. I saw black squirrels in Washington DC (near Walter Reed AMC). It flipped me out there too! I live outside of Washington DC and have had black squirrels visit my backyard. I have only seen a few each year, but they are out there. It actually freaked out my dog when she spotted one for the first time! They are black in Detroit too, so clearly some have gotten past border patrol. In Texas we have both brown squirrels and black squirrels. We call the black squirrels rock squirrels although I don't know if this is what they are actually called. I haven't seen a black squirrel in about 10 years though. We have some black squirrels here in Frederick, MD. Cute little things. 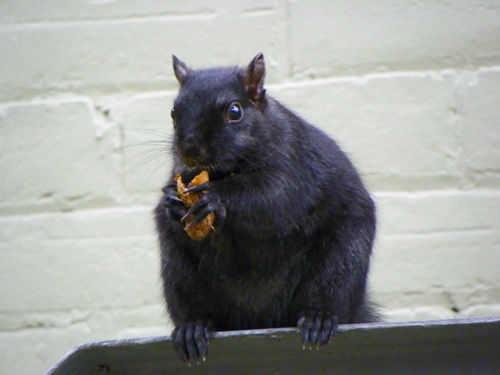 Thank you all for your black squirrel reports! Apparently these rogue squirrels have hopped on trains and traveled to Philly, Amherst, DC, Detroit, Texas and Frederick. I will be on the lookout for one of these elusive albino squirrels too. The tiny red squirrels of Nova Scotia sound cute too. The black squirrels are actually in charge of opening new Tim Hortons in the U.S.
Come to Syracuse! We have black squirrels all over the place here. I went to school at RPI in Troy and we had Alby the Albino Squirrel there. You need to head to Exeter Ontario - home of the white squirrel. I saw one when I was there and squealed. In Michigan, we have red, grey, black and brown but I had to go to Exeter to see the white squirrels. Closer to home! U of R's River Campus has albino squirrels - spend a bit of time on the quad and you should see one - also some splotchy - white/ brown mixes. I always kinda thought they had gotten into some radioactive hospital waste or something. i've never seen them in western canada where i live, but i have seen them any time i've been in ontario! I've lived in Edmonton all my life and we only had Brown squirrels there ... I moved to Calgary... 3 hours away and they have Black and the odd Grey squirrel...I Love watching them run...especially across the wires overhead! We have lots of black squirrels out here in California too. I used to live in Fairport, and would sometimes see a black squirrel running around in the area of the Pittsford Y on Crestview Drive. This was a few years ago, so not sure if he or she is still running around there or not. I saw these often in Reedsburg, WI...they escaped from Barnum & Bailey's circus and pretty much are local to the area...never migrating far. I saw one the other week and though I was nuts..maybe the same sort of thing.